For allergens, see ingredients listed in bold. May also contain traces of nuts and peanuts. Chocolate Mint Flavour: Milk Protein, Hydrolysed Gelatine, Glycerine, Palm Oil, White Chocolate Chips (9%) (Sugar, Cocoa Butter, Whole Milk Powder, Emulsifier (SOJA Lecithin)), Soy Protein, Sugar, Reduced Fat Cocoa Powder, Oat flour, Gum Acacia, Raising Agent (Sodium Bicarbonate, Cream of Tartar), Flavouring, Salt, Sweetener (Sucralose). 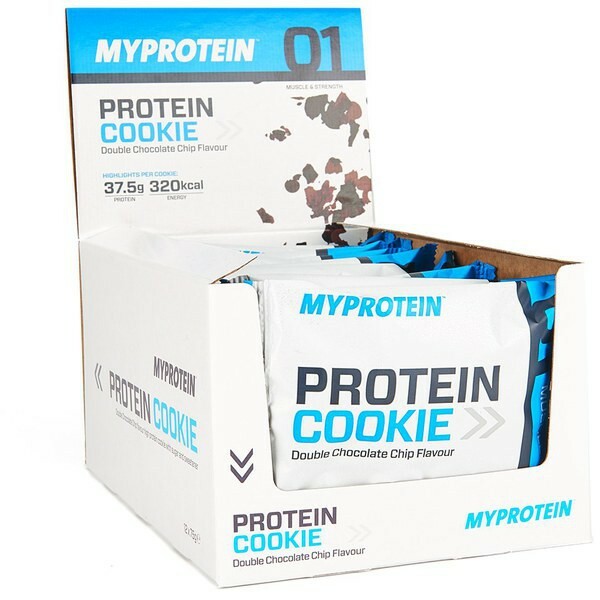 Cookies & Cream Flavour: Milk Protein, Hydrolysed Gelatine, Glycerine, Palm Oil, White Chocolate Chips (8%) (Sugar, Cocoa Butter, Whole Milk Powder, Emulsifier (SOJA Lecithin), Flavouring), Soy Protein, Sugar, Reduced Fat Cocoa Powder, Soy Protein Crispies (3%) (Soy Protein Isolate), Oat Flour, Gum Acacia, Raising Agent (Sodium Bicarbonate, Cream of Tartar), Flavouring, Salt, Sweetener (Sucralose). Double Chocolate Chip Flavour: Milk Protein, Hydrolysed Gelatine, Glycerine, Palm Oil, Chocolate Chips (9%) (Cocoa Mass, Sugar, Emulsifier (SOJA Lecithin)), Soy Protein, Sugar, Reduced Fat Cocoa Powder, Oat flour, Gum Acacia, Raising Agent (Sodium Bicarbonate, Cream of Tartar), Flavouring, Salt, Sweetener (Sucralose). Oatmeal & Raisin Flavour: Milk Protein, Hydrolysed Gelatine, Oats (15%) (Rolled Oats, Toasted Oats (Oat Flakes, Sugar, Palm Oil, Honey)), Glycerine, Palm Oil, Soy Protein, Raisins (6%), Raising Agents (Sodium Bicarbonate, Cream of Tartar), Flavouring, Spices (Nutmeg, Ginger), Sweetener (Sucralose). Rocky Road Flavour: Milk Protein, Hydrolysed Gelatine, Glycerine, Palm Oil, Soy Protein, Chocolate Chips (4.4%) (Cocoa Mass, Sugar, Emulsifier (SOJA Lecithin), Flavouring), Sugar, Reduced Fat Cocoa Powder, Marshmallows (3.5%) (Sugar, Corn Syrup, Water, Dextrose, Beef Gelatine, Corn Starch, Flavouring, Natural Colour (Beetroot Red)), Soy Protein Crispies (2.2%) (Soy Protein Isolate), Oat Flour, Fruit Pieces (1.7%) (Concentrated Apple Puree, Strawberry Puree), Fructose, Sugar, Humectant (Glycerine), Wheat Fibre, Palm Oil, Acidity Regulator (Malic Acid), Gelling Agent (Pectin), Concentrates (Black Carrot, Blueberry, Pumpkin), Natural Flavouring), Gum Acacia, Raising Agent (Sodium Bicarbonate, Cream of Tartar), Flavouring, Salt, Sweetener (Sucralose). White Chocolate Almond Flavour: Milk Protein, Hydrolysed Gelatine, Glycerine, Palm Oil, White Chocolate Chips (9%) (Sugar, Cocoa Butter, Whole Milk Powder, Emulsifier (SOJA Lecithin)), Soy Protein, Oat flour (Gluten), Sugar, Gum Acacia, Raising Agent (Sodium Bicarbonate, Cream of Tartar), Flavouring, Salt, Sweetener (Sucralose). Chocolate Orange Flavour: Milk Protein, Hydrolysed Gelatine, Glycerine, Palm Oil, Soy protein, Chocolate Chips (6%) (Cocoa Mass, Sugar, Emulsifier (SOJA Lecithin)), Sugar, Reduced Fat Cocoa Powder, Candied Orange Peel (3%) (Sugar, Orange Peel, Acidity Regulator (Citric Acid)), Oatflour (Gluten), Gum Acacia, Raising Agent (Sodium Bicarbonate, Cream of Tartar), Flavouring, Salt, Sweetener (Sucralose). Deliciously baked using cutting edge technology to create a delectably soft texture, each Protein Cookie contains more than 50% of protein, making them our highest protein snack currently available! When comparing their nutritionals to your standard supermarket cookies, each cookie contains 70% less sugar and 40% less fat to compliment a wide range of training and health goals. Each cookie contains a staggering 38g of proteins. This is a fundamental component to anyone's training program, as your body needs to fully recover in order to adapt and perform in future workouts. Increasing your protein intake will keep you feeling fuller for longer throughout the day which may prevent you snacking on junk food. Each cookie provides you with 20g of carbohydrate, which is the body's predominant fuel source during exercise such as resistance training and running. Available in an array of delectable flavours, including the latest additions of Cookies & Cream and Rocky Road. 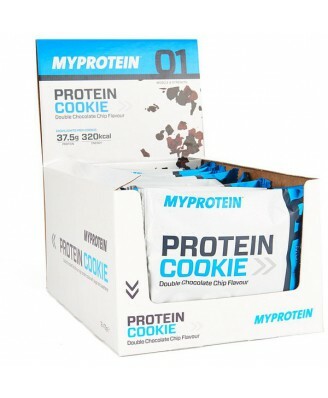 Our tasty Protein Cookies are great for consuming on-the-go, providing you with an easy way to meet your daily macronutrient requirements without excess sugar or fat. Consume as a nutritious snack to increase your daily protein intake.